Nero was a member of The Order of the Sword until Dante arrived to stop their resurrection of the legendary dark knight Sparda. As Nero tracked down and fought Dante, he learned they were actually on the same side and Nero fought against The Order and defeated them and their corrupt ways. Now while Kyrie rebuilds the town built around The Order, Nero wanders Atarius, trying to find answers to his many questions. Nero is acrobatic and possess a double barreled revolver (Blue Rose) and a sword with an engine similar to a motorcycle (Red Queen). His main power is the Devil Bringer, his right arm which has become demonic and possess special powers. 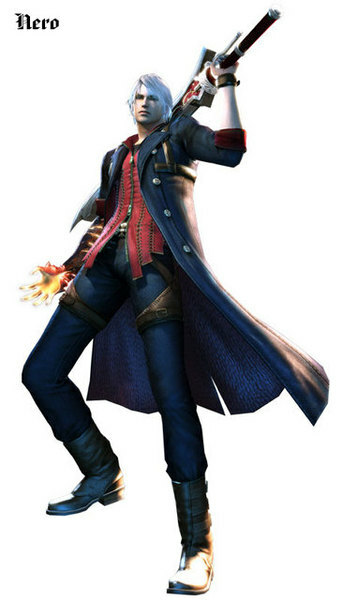 Nero can also focus his energy and increase his strength, unleashing the spirit of Dante's late twin brother Vergil, giving Nero a light blue silhouette of a demonic form around his body. Red Queen: Nero's sword with an engine, used to increase damage and sometimes hurl waves of fire with a powerful swing. Blue Rose: A two barreled revolver that can quickly be infused with Nero's demonic right arm. Never seems to run out of bullets.